In this week’s Torah portion we read about the priests Nadav and Avihu dying before the Lord, the Masoretic Text states the following, Vayikra / Leviticus 10:1-3, א וַיִּקְחוּ בְנֵי-אַהֲרֹן נָדָב וַאֲבִיהוּא אִישׁ מַחְתָּתוֹ וַיִּתְּנוּ בָהֵן אֵשׁ וַיָּשִֹימוּ עָלֶיהָ קְטֹרֶת וַיַּקְרִיבוּ לִפְנֵי יְהוָֹה אֵשׁ זָרָה אֲשֶׁר לֹא צִוָּה אֹתָם: ב וַתֵּצֵא אֵשׁ מִלִּפְנֵי יְהוָֹה וַתֹּאכַל אוֹתָם וַיָּמֻתוּ לִפְנֵי יְהוָֹה: ג וַיֹּאמֶר מֹשֶׁה אֶל-אַהֲרֹן הוּא אֲשֶׁר-דִּבֶּר יְהוָֹה | לֵאמֹר בִּקְרֹבַי אֶקָּדֵשׁ וְעַל-פְּנֵי כָל-הָעָם אֶכָּבֵד וַיִּדֹּם אַהֲרֹן: 10:1 Now Nadab and Abihu, the sons of Aaron, took their respective firepans, and after putting fire in them, placed incense on it and offered strange fire before the Lord, which He had not commanded them. 10:2 And fire came out from the presence of the Lord and consumed them, and they died before the Lord. 10:3 Then Moses said to Aaron, ‘It is what the Lord spoke, saying, ‘By those who come near Me I will be treated as holy, And before all the people I will be honored.’‘ So Aaron, therefore, kept silent. (NASB) Here the Lord God states, הוּא אֲשֶׁר-דִּבֶּר יְהוָֹה | לֵאמֹר בִּקְרֹבַי אֶקָּדֵשׁ “this is what the Lord said I will be sanctified through those who draw near to me.” This is a significant statement for us today in light of the Lord God dwelling in our midst and in our hearts! Remember, back in Parashat Yitro (Shemot / Exodus 29:43) the Lord God said וְנֹעַדְתִּי שָׁמָּה לִבְנֵי יִשְֹרָאֵל וְנִקְדַּשׁ בִּכְבֹדִי “this is where I will make Myself known to the Children of Israel, and where My glory will be sanctified.” Our attitude and approach is of the greatest importance to God and to us as worshipers. Having a purity of heart (unblemished motivation, תמים) that is rooted in a desire to walk in God’s ways is being illustrated here in this event of the death of Nadav and Avihu. We find these very same concepts here in the Apostolic Writings, James 4:7 Submit yourselves, then, to God. Resist the devil, and he will flee from you. 4:8 Draw near to God, and He will draw near to you. Cleanse your hands, you sinners, and purify your hearts, you double-minded. (NASB) and 1 Peter 3:15 but sanctify Christ as Lord in your hearts, always being ready to make a defense to everyone who asks you to give an account for the hope that is in you, yet with gentleness and reverence; (NASB) Notice how James speaks of resisting the devil and cleansing our hands from sin (not practicing sin) and purifying the heart. Peter peaks of sanctifying the Lord in our hearts. This is very similar to Shemot / Exodus 29:43 הוּא אֲשֶׁר-דִּבֶּר יְהוָֹה | לֵאמֹר בִּקְרֹבַי אֶקָּדֵשׁ “this is what the Lord said I will be sanctified through those who draw near to me.” Peter connects this sanctification of God’s glory in our hearts to always thinking upon God’s word which allows us to give an answer when asked for the hope that we have. Always keeping God’s Word in our hearts is a Torah centric principle from Devarim / Deuteronomy 6:6-7, ו וְהָיוּ הַדְּבָרִים הָאֵלֶּה אֲשֶׁר אָנֹכִי מְצַוְּךָ הַיּוֹם עַל-לְבָבֶךָ: ז וְשִׁנַּנְתָּם לְבָנֶיךָ וְדִבַּרְתָּ בָּם בְּשִׁבְתְּךָ בְּבֵיתֶךָ וּבְלֶכְתְּךָ בַדֶּרֶךְ וּבְשָׁכְבְּךָ וּבְקוּמֶךָ: 6:6 These words I am commanding you today are to be upon your hearts. 6:7 And you shall teach them diligently to your children and speak of them when you sit in your house and when you walk along the road, when you lie down and when you get up. (BSB) Here Nadav and Avihu are said to have offered strange fire, offering fire when the Lord had not commanded. The rabbinic literature describes this event in the following way according to Daat Zkenim and Ibn Ezra. בקרובי אקדש, “I will become sanctified by means of the people who had been close to Me.” The very death of these people is an event which sanctifies Me. How so? If the Israelites will internalize how strict I have been with these highly placed individuals, they will know how careful they have to be not to deviate from My commandments. The idea here is the priests come close to the Lord to sanctify themselves not by doing what they think is best but by doing what God thinks is best. This warning was given to the priests “so that the Lord will not break out against them” and this warning was given so they would be on guard to not infringe upon God’s commands that he has laid down for our lives. Any deviation on their part would lead to the Lord God sanctifying His name through the immediate fatal punishment as we see here in the case of Nadav and Avihu. Note what we read in Vayikra / Leviticus 21:10-15 which states, “21:10 ‘The priest who is the highest among his brothers, on whose head the anointing oil has been poured and who has been consecrated to wear the garments, shall not uncover his head nor tear his clothes; 21:11 nor shall he approach any dead person, nor defile himself even for his father or his mother; 21:12 nor shall he go out of the sanctuary nor profane the sanctuary of his God, for the consecration of the anointing oil of his God is on him; I am the Lord. 21:13 ‘He shall take a wife in her virginity. 21:14 ‘A widow, or a divorced woman, or one who is profaned by harlotry, these he may not take; but rather he is to marry a virgin of his own people, 21:15 so that he will not profane his offspring among his people; for I am the Lord who sanctifies him.” (NASB) The point Moshe is making here is that the higher the rank of a person, the more strictly God applies his commandments on their conduct. The priest being commanded not to attend his father or mother’s funeral demonstrates God’s honor comes first and is not to take time out for himself for his own personal concerns. The instruction here relates to considering the things of God first and foremost. Ibn Ezra also states the following concerning Vayikra / Leviticus 10:3. Ibn Ezra looks at the idea of God’s holiness being manifest in His people, specifically here in the priesthood. Notice how he comments those who draw near to the Lord and suffering. This does draw in the context of our suffering for the Lord, however in this case we see Nadav and Avihu suffering because of their sins, they died, and God had sanctified His Name through that event. In the beginning, the Lord God gave man and woman purpose. He blessed mankind to “be fruitful and multiply” in order to “fill the earth and subdue it and have dominion” (Bereshit / Genesis 1:28). This blessing upon Adam and Eve was made in Eden, the epicenter of God’s relational presence in creation. The idea may have been that as this new family grew, so too would the boarders of the Garden and God’s presence would go with it. This is the concept behind the kingdom of God dwelling within us, that we are to take God’s presence into the world and share what He has done throughout the earth. (Bamidbar / Numbers 14:21, Tehillim / Psalms 72:19, and Isaiah 11:9). Principally, this is the gospel life, God’s relational presence throughout the world. This is what we are being taught here in the book of Leviticus on the sanctification of God’s people, drawing near, seeking the Lord, seeing His presence, and hearing his voice. This is why David proclaims, “in your presence there is fullness of joy, at your right hand are pleasures forevermore” (Tehillim / Psalms 16:11). We are to push all of our peripheral issues to the side, giving them to the Lord, and consider the things of God first and foremost, this is all that is left and all that really matters. The verses we are looking at for this week are Vayikra / Leviticus 10:1-22. A lot of commentaries describe this situation with Nadav and Avihu as related to alcohol. The Lord states that one is not to drink wine (alcohol) when going before the Lord. (י וּלְהַבְדִּיל בֵּין הַקֹּדֶשׁ וּבֵין הַחֹל וּבֵין הַטָּמֵא וּבֵין הַטָּהוֹר: יא וּלְהוֹרֹת אֶת-בְּנֵי יִשְֹרָאֵל אֵת כָּל-הַחֻקִּים אֲשֶׁר דִּבֶּר יְהוָֹה אֲלֵיהֶם בְּיַד-מֹשֶׁה: ) Vayikra / Leviticus 21:10-15 describes this in a slightly different way speaking of how the Lord deals out justice in the midst of sin in relation to the righteous. He keeps two extremes with the righteous, one of which the Lord is more stringent with the righteous than with their contemporaries and two the Lord punishes even for the slightest sin. The reason that this is an important observation is for the people to recognize a kal vechomer. The Kal Vechomer is if the Tzadik (Righteous) were punished for a lesser sin, how much more so us and our sins! If only the big sins were punished, the people would not be able to learn this kal vechomer. This indicates for us how those who teach are held to a higher standard. (James 3:1) This is consistent with what Rashi writes, “For if not, those that were greater would say that no punishment will reach them, and only those of lesser stature would take the message to heart, and even those equal to them would not be reproved, as each one will mistakenly think he is greater than his fellow.” James wrote that condemnation is to those who appoint themselves as “blind leaders leading the blind” (Matthew 15:14) in the sense that the average man does not have a right to exercise the function of the priesthood (spiritual leader) “but he that was called of God, as was Aaron” (Hebrews 5:4). This follows through the context of what we read in the Apostolic Writings that the Scribes and Pharisees loved respectful “greetings in the markets, and to be called of men ‘Rabbi, Rabbi’” (see Matthew 23:1-12). The idea here is that there is one Master, Christ, and (Matthew 23:10 “But do not be called Rabbi; for One is your Teacher, and you are all brothers. NASB) The greater judgment come more strictly to the anointed priest who wasn’t above death while sinning. If this is true, then how deep is the responsibility that is incurred upon those who place their faith in the Messiah Yeshua, and then teach others? In the Torah, the measure for taking an item and making it clean, it must pass through the fire, and/or through the water. In the sense of a teacher who goes before God and men, his work will be tested by fire (1 Corinthians 3:11-15) as Paul wrote to the Corinthians. The idea here is that if his teaching is burned up, he will have escaped with his own soul and no reward will follow. Teaching God’s people must be done in purity, with good intentions. What Nadav and Avihu are teaching us is to seek God’s Word and His ways and not rely upon our own ways. The rabbis comment on the way the Torah (see Rabbeinu Bahya, Vayikra 10:1) is written Nadav and Avihu וַיָּשִֹימוּ עָלֶיהָ, “they placed on it” instead of writing וישימו עליהם, “they placed on them.” (Note how there were two censers, each brother having his own censer.) The comparison is to the 250 men who offered incense (Parashat Korach, Bamidbar / Numbers 16:18) in the case of the 250 men the Torah writes, “they placed it on them,” (upon the censers, plural). The instructions on the correct procedure in the Torah (Bamidbar / Numbers 16:17) Moses had told these men ונתתם עליהם קְטֹרֶת “place on them incense.” (No mention had been made of fire although the 250 men added their own fire.) The word עליה as distinct from עליהם and the rabbis say this is an allusion to the attribute of Justice. The Torah is giving us an insight into the thinking of Nadav and Avihu at that time. They knew that incense was intended to counter, to stop the attribute of Justice in its tracks. This is interpreted from what Moshe did in Devarim / Deuteronomy 33:10 “they place incense to placate Your anger.” The word קְטֹרֶת itself means הִתְקַשְּׁרוּת רוח במדות, “establishing a spiritual affinity.” The Aramaic translation of the word ותקשור, (Bereshit / Genesis 38:25) “she tied” is וקְטֹרֶת. This spiritual affinity established by means of the incense is meant to draw down an abundance of heavenly blessings by means of the attribute of Justice, which in turn will confer these blessings on the person burning up the incense. What these things are teaching us are about the holiness of the house in which God dwells, and the importance of sanctifying the Name of God by those who draw near. Consider What Paul wrote in 1 Corinthians 3. Can you see the parallel here to the things we have been studying from the Torah on Nadav and Avihu? Paul speaks of the spiritual immaturity of the people in Corinth, and we find the spiritual immaturity of Nadav and Avihu presumptuously going before God and then dying because of their sins. Paul speaks of the person of faith becoming ground upon which the Lord plants seed and our lives bear fruit. Faith in Yeshua the Messiah causes us to become God’s field, God’s building (1 Corinthians 3:9). Paul goes on to describe the building upon a foundation, and doing so with precious metals, and other things. He draws in a Torah context of purification stating that all things will be revealed with fire, tested with fire, and that which is burned up a man will suffer loss. He then says that we are God’s Temple, and the Spirit of God dwells within us. (1 Corinthians 3:17 If anyone destroys God’s temple, God will destroy him. For God’s temple is holy, and you are that temple. ESV) So the parallel may be drawn to what the rabbis discuss regarding the word קְטֹרֶת meaning הִתְקַשְּׁרוּת רוח במדות, “establishing a spiritual affinity.” The Aramaic translation of the word ותקשור, (Bereshit / Genesis 38:25) “she tied” is וקְטֹרֶת. This spiritual affinity established by means of the incense is meant to draw down an abundance of heavenly blessings by means of the attribute of Justice, which in turn will confer these blessings on the person burning up the incense. What these things are teaching us are about the intentions of our heart, of purity and holiness within as being the house of God in which He dwells. This brings a wonderful context to our sanctifying the Name of God in our hearts and in our lives because we are those who draw near. It is unfortunate that this topic is rarely if ever emphasized in the church today. The holiness of God is what sanctifies us, and He did this by sending His Son Yeshua the Messiah laying his life down on our behalf. The attribute of justice God has given to us by His mercy, is due to our relationship with Him. The Lord God Almighty wants great things for us and our lives. 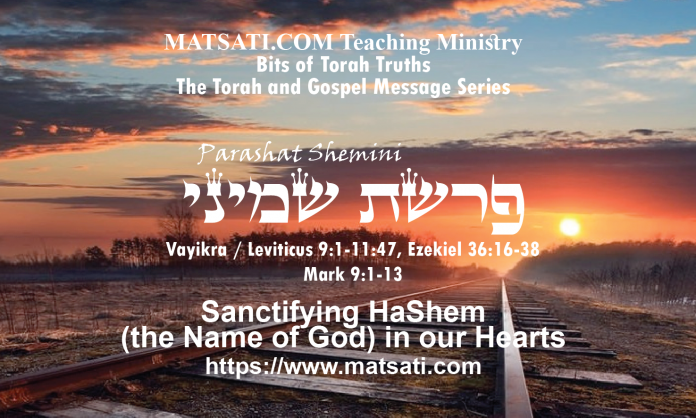 The thing that might be holding his blessing back may be the very thing we are talking about here in this study in relation to sanctifying the Name in our hearts and in our lives. When we sanctify the Lord in our hearts, we will always be drawn to repentance before God. Just as we see how Nadav and Avihu error in the address to which they offered their incense, we do not find written in the Torah about what they did as אִשֵּׁה רֵיחַ-נִיחוֹחַ לַיהוָֹה, “as a fire-offering of pleasing fragrance to the Lord,” but the very attribute of Justice to whom they addressed their offering smote them. This is the meaning of the words וַתֵּצֵא אֵשׁ מִלִּפְנֵי יְהוָֹה וַתֹּאכַל אוֹתָם, “fire came forth from the presence of the Lord and consumed them so that they died” (Vayikra / Leviticus 10:2). Let us sanctify the Lord in our hearts so His Name will be glorified! The Lord God is merciful, and we are greatly thankful for that, so we have the opportunity to repent from our sins, to start again, and to sanctify His Name in our hearts and our lives for His glory! Studying the Apostolic Writings (NT), we can see how the disciples understood these things and were teaching these things to us according to the Torah! This is how the Torah and the Gospel Message go hand in hand!